Chop the pumpkin into 2cm cubes. Place the pumpkin into a drip pan, drizzle with 1 tablespoon olive oil and season with salt and pepper. Thoroughly wash the beetroots, wrap in an alfoil parcel. Once the barbecue has preheated, make adjustments to the burner control(s) if required for roasting. Place the drip pan of pumpkin on to the barbecue, alongside of the beetroot parcel and cook for 40 minutes. 10 minutes into the cooking time, cut the red onion into wedges. Add the onion wedges to the pumpkin drip pan. While the vegetables are roasting, make the balsamic glaze. In a saucepan, on a side burner (or stovetop) heat all of the balsamic glaze ingredients together on medium heat, constantly stirring for 5 minutes or until the glaze has reduced and slightly thickened, set aside to cool. Once the pumpkin, onion and beetroots have cooked, remove from the barbecue. Allow the vegetables to cool enough to peel the beetroots. Once the beetroots have cooled enough to handle, peel and slice into halves. 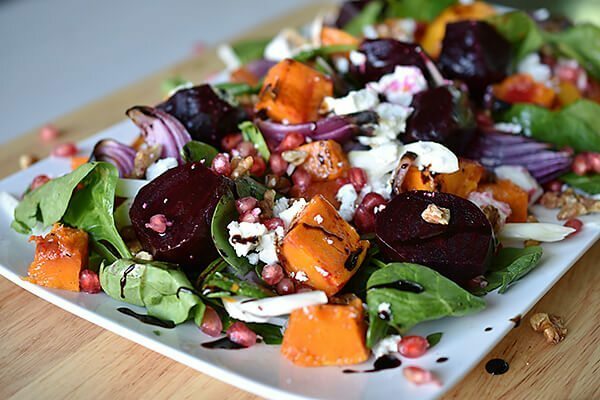 Mix the pumpkin, onion and beetroot with the baby spinach and fennel. Top with the pomegranate, crumbled feta cheese and walnuts. Whisk the balsamic glaze and pour over the salad.